Preheat the broiler to high and adjust the rack second from the top. Arrange the tomatoes on a baking tray and season with salt and pepper. Top each with 1/4 cup tuna salad and a slice of cheese. 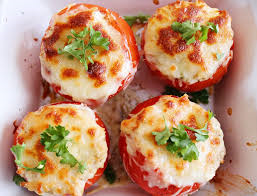 Broil the tomatoes until the cheese is melted- about 1-2 minutes.